Cosmetic treatments have come a long way in the last twenty years in terms of affordability and availability. Nowhere is this more evident than with Botox. Botox is a form of dermal filler that aims to firm and plump the skin reducing wrinkles and the other signs of aging. Botox is especially relevant to dentists and dentists who have recently had cosmetic dental treatment because the skin around the mouth frames the smile and could spoil the appearance of an otherwise brilliant and stunning smile. Originally Botox was used solely by the very rich and wealthy because it was very expensive but over the last ten or so years it has been adopted and offered by more and more cosmetic dentists in India. This increase of supply has brought the price down to a more competitive level and allowed more people to benefit from the rejuvenating effect of Botox. There is also very little risk involved if carried out by a trained dentist as Botox has been judged to be perfectly safe for use in the human body and breaks down naturally over the course of about four months. Mini-implants are a relatively new way of securing dentures to alleviate the anxiety suffered by many wearers that their dentures are going to fall out. They also make eating a lot easier and remove the need for messy denture adhesive strips and gels. When patients lose several or all of their teeth their dentist may recommend dentures to restore the appearance and functionality of the teeth. Missing teeth cause many dental health problems, as well as removing rigid facial structure that supports the muscles on the face. This often creates a sagging appearance in the face that can become permanent if not addressed. Dentures are the solution to these problems, restoring not just the appearance of healthy teeth but also allowing the patient to eat and talk naturally. Dentures should ideally stay in place through suction alone but due to gum erosion and the changing shape of gum tissue they can often become loose and prone to slipping out. This can be a worry and make eating a very difficult experience. 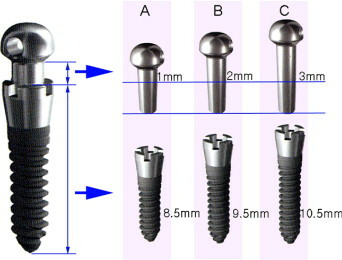 Mini-implants are small metal screws implanted directly into the jawbone to act as a solid base for the dentures. The dentures are fitted with small metal clips which are then able to clip on and off to the mini-implants as desired. This means the dentures are held firmly in place when needed and easily removed for cleaning and sleeping. There isn’t even a need to get new dentures as the clips can easily be attached to your existing set. Five mini-implants will be needed in total and can be positioned with ease during a short surgical appointment. They will need several weeks to fuse with existing tissue but could make a huge difference to your life. Ask your dentist if you are concerned about loose dentures.